1. This thing was all white... white paint, white knit vinyl, and white rag top. I don't know if there were any stripes originally, or if the hood had the black on it, or was it just all white. How would I tell that? 2. It had Air Conditioning. In a convertible. Hehe. That makes me laugh. But maybe that makes it all the more valuable as it's likely rarer? 3. It was actually built in Sept 1971. Funny that it's a "1972". Car year dating is just weird, sez I. 4. What does "Convenience Group" mean? 5. Also, what does "Decor Group" mean? AC is somewhat unusual for a ragtop, but by 1972 it was more popular than you think. I'm overseas so I can't tell you how many ragtops had AC, but it's listed in Kevin Marti's book. Go to the top of the page, you'll see a Mustang Data tab. Click on it, the 1971 Facts brochure will give you an idea, '72s are probably close to the same. Page 20 has a good listing of the convenience group. drsharp, you have a very well optioned car. Good thing it was equipped with the lower body side paint or it would have looked like a snow ball rolling by. 1. In 1972 the only way to have received the black or argent paint on the hood was to order the Ram Air option which is not listed on your Marti report. 2. AC was becoming a more popular option. Especially at times in the summer when it just was too hot for the top to be down or going somewhere and you didn't want the Windblown look! The Marti Book "By The numbers" shows 2.142 verts with factory AC produced in 1972. 3. The calendar for the auto manufactures is way different from what us commoners are used to. Production for the current model year normally winds down in late July. Some vehicles may run little over. This gives time for the manufacture to make what ever changes need to be done on the assembly line to prepare for any new models and changes on current vehicles. Also gives time for any personnel training and to make test runs to see if any problems need to "Ironed" out. Since new model introduction is normally in September it also allows time for enough vehicles to be built so Fords 5,000 + dealers have enough new stock for new vehicle show day! 4. Convenience Group: Includes trunk light, glove compartment light, map light, under hood light, headlights-on warning buzzer, automatic seat back release, under instrument panel courtesy lights (standard on verts), park brake warning light, and locking glove box. Lots of nice items in this option! 5. Decor Group: Includes lower body side paint treatment with bright chrome upper moulding, unique black honeycomb grill and sportlamps (Mach 1 Grill), color keyed front urethane bumper with color keyed front fender and hood mouldings, and trim rings and hub caps. 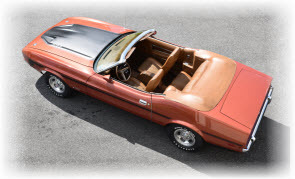 For 72 the body side tape stripe you mentioned earlier was available as a stand alone option only on the Mach1 or on a base hardtop or vert in conjunction with the Decor Group option. If equipped it would have been listed as Body Side Tape Stripe under "Your Vehicle Was Equipped With The Following Features". You have a really nice "Mid-Life" project car! Very nice and well-equipped car!!!! Steve pretty much covered what your questions were. I did think that you could get the NASA hood as a stand alone option. It came with the 351 Q code in 72 but the black out and hood locks were also an option and could not be had separate. On the air conditioner. I hear this at shows all the time, my 73 vert has air. Everyone wants to know why you have air on a vert. Obviously they have never owned a vert. If you ride with the top down you will get cooked by the sun. Better wear lots of sun screen, lol. If you have the top up it gets hot so the air is a great option I feel. Now a question for you. My 73 vert had white top and CW white comfort weave interior. What is the color of your top well liner? That is the well where the top drops into when down. You car has lots of great options. I just went to look at a parts car with similar options but have not made a deal. Hope you make it through your crisis with a little money left. (09-02-2018, 07:52 AM)Carolina_Mountain_Mustangs Wrote: Steve pretty much covered what your questions were. I have never seen any other well liner color, but black. The color of the boot cover should match the interior color, with the exception of cars with white interior which came with black boot covers. At least my old 73 vert I had back in 1975 with white interior had a black boot cover. I am always looking to learn something new about our cars Dave, were there other combinations? As others have said you have a very well optioned Mustang for use! Power windows are very rare!